(Nanowerk News) Scientists have a long and unsuccessful history of attempting to convert hydrogen to a metal by squeezing it under incredibly high and steady pressures. Metallic hydrogen is predicted to be a high-temperature superconductor. A superconductor is a state of matter where electrons, and thus electricity, can flow indefinitely and without resistance. In a paper published this week in the online edition of the Proceedings of the National Academy of Sciences, a team of scientists from Cornell University and the State University of New York at Stony Brook announce a theoretical study that predicts the metallization of hydrogen-rich mixtures at significantly lower pressures. By adding small amounts of lithium to hydrogen, the study calculates that the resulting system may be metalized at around one-fourth the pressure required to metalize pure hydrogen. Funding for the project was provided by the National Science Foundation (NSF). Hydrogen and lithium are the first and third lightest elements in the universe, respectively. Under the temperature and pressures found on Earth, hydrogen is a gas and lithium is a metal. In hydrogen gas, the atoms are robustly bonded together in pairs and each hydrogen atom contributes one electron to the bonding. In chemistry shorthand, hydrogen is called H2. Hydrogen and lithium normally react with each other to form a stable compound. This lithium-hydrogen compound, or LiH, is not metallic. Metallic hydrogen is thought to be present in the interiors of planets like Jupiter and Saturn because of the intense gravitational forces and pressures that are found there. On Earth, researchers have tried to pry loose hydrogen's electron by squeezing it between the facets of a diamond anvil cell under pressures up to 3.4 million atmospheres. The pressure at sea level is one atmosphere. The pressure at the center of the Earth is around 3.5 million atmospheres. Scientists have not been successful with this method of steady pressures. They have been, however, with shock-wave methods. To get around hydrogen's decidedly fixed stance of not becoming a metal under currently accessible laboratory pressures, the research team used sophisticated computer programs. The programs theoretically calculate if hydrogen can be metalized by combining a lithium atom with varying numbers of hydrogen atoms. The programs also compute if metallic hydrogen can be made under pressures achievable in a laboratory. The lithium and hydrogen combinations predicted by the study currently do not exist on Earth. One of the combinations predicted by the team contains one lithium atom for every six hydrogen atoms or LiH6 (see top right image). The complex calculations predict that in the hypothetical compound the Li atom is triggered to release its lone outer electron, which is then distributed over the three H2 molecules. Under pressure, the hypothetical reaction forms a stable and metallic hydrogen compound. The calculations also predict that LiH6 could be a metal at normal pressures. However, under these conditions it is not stable and would decompose to form LiH and H2. "The stable and metallic LiH6 compound is predicted to form around 1 million atmospheres, which is around 25 percent of the pressure required to metalize hydrogen by itself," said Eva Zurek, lead author of the paper and an assistant professor of chemistry at The State University of New York, Buffalo. "Interestingly, between approximately 1 and 1.6 million atmospheres, all the LiH combinations studied were stable or metastable and all were metallic," said Roald Hoffmann, co-author, recipient of the 1981 Nobel Prize in chemistry and Cornell's Frank H.T. Rhodes Professor of Humane Letters, Emeritus. Another one of the hypothetical compounds studied by the team was composed of one lithium atom and two hydrogen atoms or LiH2. 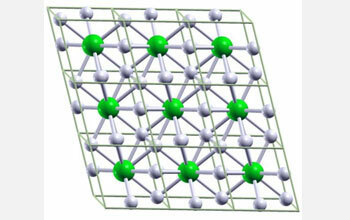 "The theoretical study opens the exciting possibility that non-traditional combinations of light elements under high pressure can produce metallic hydrogen under experimentally accessible pressures and lead to the discovery of new materials and new states of matter," said Daryl Hess, a program director in the NSF Division of Materials Research. "Once again, these researchers have taken chemistry to a new frontier," said Carol Bessel, a program director in the NSF Division of Chemistry. "They have described, through their theories and calculations, molecules that test our fundamental assumptions about atoms, molecules and structures. In doing so, they challenge the experimentalists to make what they have imagined in their minds a reality to be held in the hand." The team members believe the information gleaned from the study suggests that one may combine large amounts of hydrogen with other elements. The information may also some day assist with the design of a metallic hydrogen-based superconductor. "We have already been in touch with laboratory experimentalists about how LiH6 might be fabricated, starting perhaps with very finely divided forms of the common LiH compound along with extra hydrogen," said Neil W. Ashcroft, co-author, and Cornell's Horace White Professor of Physics, Emeritus. Additional authors include Artem R. Oganov, an associate professor, and Andriy O. Lyakhov, a post doctoral research associate, of the State University of New York at Stony Brook, Department of GeoSciences. Zurek was a postdoctoral associate in Hoffmann's research group when the studies were completed.